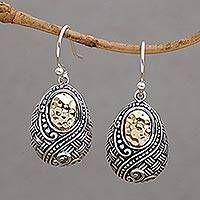 Sterling silver sunflowers are captivating as earrings crafted with an antiqued finished. By Diah Arini in Bali, the earrings are centered by sunny 18k gold plated accents. Nature is a muse for Ying, inspiring this lovely handcrafted design. 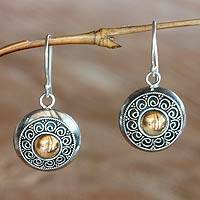 Sterling silver leaves nestle together with gold vermeil foliage in elegant button earrings. Bathed in luxurious 24k gold, a textured hoop hosts a hammered oval dipped in silver. Thailand's Khun Boom. 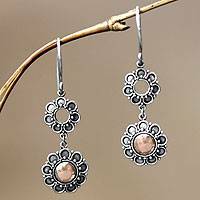 crafts beautiful earrings that dance on sterling hooks.